Food colouring, two of your choice. Cut 16 (5”x 5”) pieces of plastic wrap and line 16 muffin tin spaces. Set aside. In a small bowl combine ¼ cup hot water and gelatin. Whisk until dissolved. Set aside. In a medium bowl, beat cream cheese until smooth, scraping down sides between mixing (approximately 5-7 minutes). Add granulated sugar, vanilla and sour cream, mix until smooth. While continuing to mix, add prepared gelatin in a slow, steady stream. Mix just until combined. Divide mixture into three bowls. Add desired food colouring (one to two drops) to two of the three bowls of cream cheese mixture. 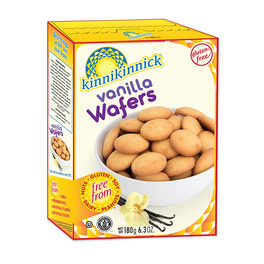 Place a Kinnikinnick Vanilla Wafer (flat side down) in each plastic-wrap-lined muffin tin space. 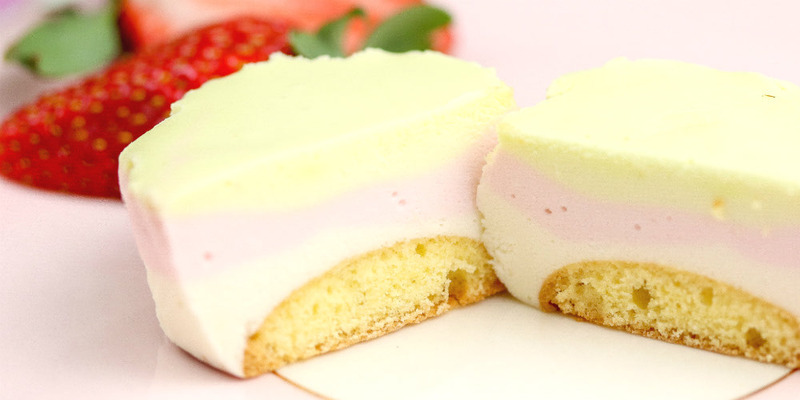 Fill each space with cheesecake mixture. Start with the plain coloured mixture divided between the 16 muffin tin spaces. Cover vanilla wafer, but avoid getting on the sides. Repeat with next two colours of cheesecake mix, waiting 5 minutes between each layer to allow it to set a little. Use a knife or an offset spatula and spread top layer so it's even. Place in fridge for minimum 4 hours. Remove from refrigerator and carefully lift out of muffin tin. Remove plastic wrap and place on a serving tray. Serve with your favourite fruit topping or sauce.